The Revolutionary War in the Lymes started as a rebellion of ideas. From its origins in the Cromwellian Saybrook Colony, Lyme (today's Lyme, Old Lyme, East Lyme and Salem) prospered under the free hand of self-governance and spurned King George III's efforts to rein in the wayward colonies. In 1765, Reverend Stephen Johnson wrote incendiary missives against the Stamp Act. A few years later, the town hosted its own Tea Party, burning one hundred pounds of British tea near the town green. 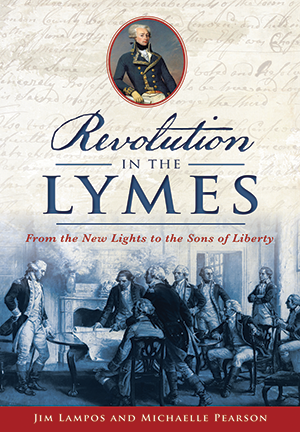 When the alarm came from Lexington in 1775, Lyme's citizens were among the first to answer. Historians Jim Lampos and Michaelle Pearson explore how local Patriots shaped an epic revolt. Jim Lampos and Michaelle Pearson live in Old Lyme, Connecticut. They have also written Remarkable Women of Old Lyme and Rum Runners, Governors, Beachcombers & Socialists: Views of the Beaches in Old Lyme.